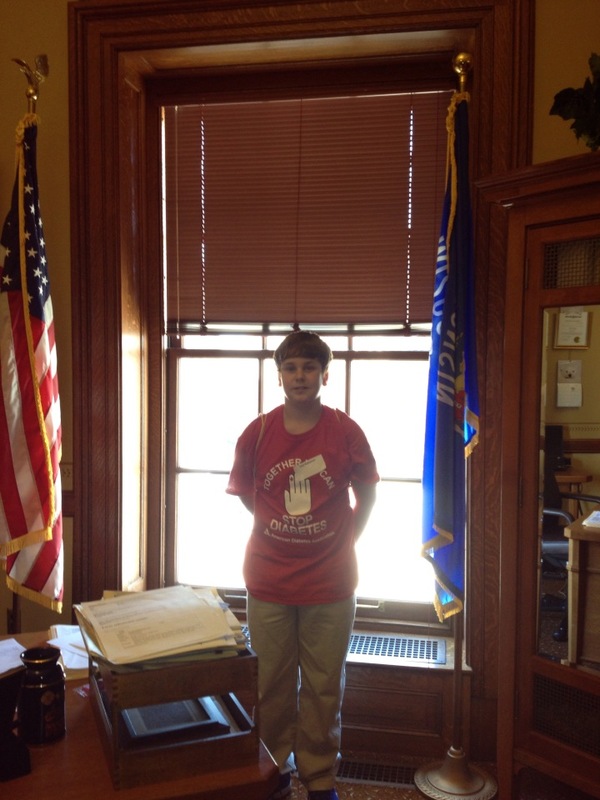 Joey in the office of a Senator, hmm..
My son is taking on and conquering way more than I ever could have at age 11! I am so proud and excited for him. It sounds like a cliché, but I really am amazed at what he is doing. He was very nervous about taking on the Wisconsin Ambassador position for the American Diabetes Association – and rightfully so. He would have to speak in front of people that he has never met, tell his story about having type 1 diabetes, and try to inspire kids and adults alike. I believe that he is doing that and more. 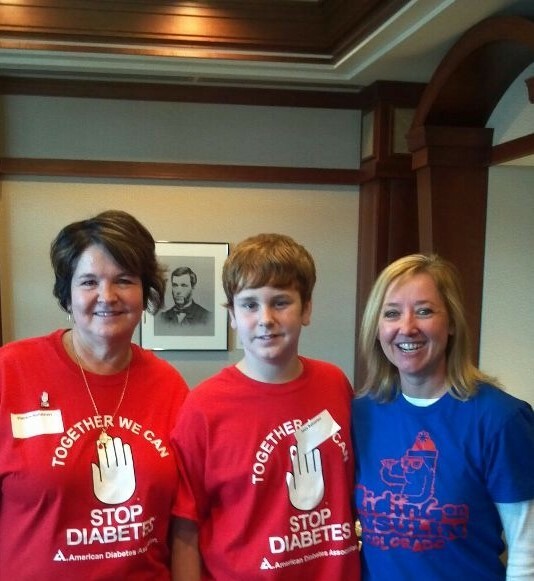 As part of the Ambassador program, Joey was invited to take part in the Diabetes Day at the Capitol. It’s a day where volunteers from around the state of Wisconsin come to Madison and go before lawmakers to gain support for diabetes issues. You really gain insight as to how the system works. We went in groups over to the Capitol. Our group consisted of Joey and me, a man who works for a pharmaceutical company that sells insulin, and Dr. Patel, MD, DPhil, FRCP, BM, Bch, from Froedert Hospital. Dr. Patel is also the current President of the American Diabetes Association. I don’t know what all the degrees stand for after Dr. Patel’s name, but I can tell you that I am glad I didn’t know who he was when we started out. I would have been so intimidated and nervous that I probably wouldn’t have uttered a word. HA-HA. We were assigned appointments with specific senators and/or state representatives, and then given a couple names to drop in on. We sat down and each of us in the group offered insight into how diabetes affects the family (both from a personal and financial standpoint), how it affects our state’s budget and how certain laws are hindering people that use insulin. For instance, did you know there’s a law in place that dictates that if someone who has their Commercial Driver’s License (CDL) and is prescribed insulin is pulled over for a moving violation, they will immediately lose their CDL license? Even if it’s for something as simple as not wearing a seat belt! That in turn can cause a loss of income, loss of insurance and an inability to pay for healthcare; hence, the state becomes responsible for that person’s health and well being. We are asking our law makers to drop that law – it’s old and from the 70’s when we didn’t have the devices that we have today, allowing us to be healthier with diabetes. Joey was great and he wasn’t shy at all. He started to talk about his pump and how it works, and then pulled up his shirt to show off his Pod! He told his diagnosis story and explained the difference between type 1 diabetes and type 2 diabetes. He was unbelievable. I was so proud and I only cried once. That of course is what Joey told his dad when we got home: MOM CRIED! Dr. Patel thanked Joey for doing an “outstanding” job representing type 1 diabetes, which made Joey (and mom) beam with pride. One highlight for me was getting to meet someone whose story I have been following and who I have admired for some time now. Her name is Michelle. Michelle’s son passed away from complications of type 1 diabetes three years ago at the age of 13. Michelle is such a strong advocate for type 1 diabetes awareness and education. She was there to tell her story to the lawmakers – a side of diabetes that cuts us all to our core. Michelle’s story really hits home, and unfortunately, there are so many others like hers. I encourage everyone to attend an event like this. It was such a great learning experience. We got to tell our lawmakers about the disease that we are passionate about and try to make a difference in the lives of those with diabetes. Yeaaaaah Joey! Way to go!